I used Hudson Canola Oil, specifically for the deep frying of the vadas as I had got this bottle of oil as a product sampler. As a family who isn't too much into deep frying, we did feel the light and non messy (and non-smelly) Canola Oil to be perfect for deep frying. Having used Sunflower oil, I naturally felt it was the best till I used this. I am sure over the next few months we would use this brand more in my kitchen. Sending this to BM # 32 under Alphabet "I" and also to Gayatri's Mom Special. Wash and soak the rice and dals together for 1-2 hours. Drain, and grind to a fluffy batter without adding any extra water. Test of a good batter is that it should float on the surface in a cup of water. Meanwhile, beat the curds well with half the milk free of any lumps. Grind the masala ingredients with a little water and add salt and mix with the yoghurt-milk mixture to a smooth gravy texture. Prepare the tempering with mustard seeds and pour onto the gravy. In a wide bowl, mix the hot water and the remaining milk well. If making ahead, add few teaspoons more milk to the gravy to ensure the curd doesnt turn sour (especially in summers). Let the vadas soak in the batter for a minimum 2 hours to ensure the gravy gets absorbed in the vadas. 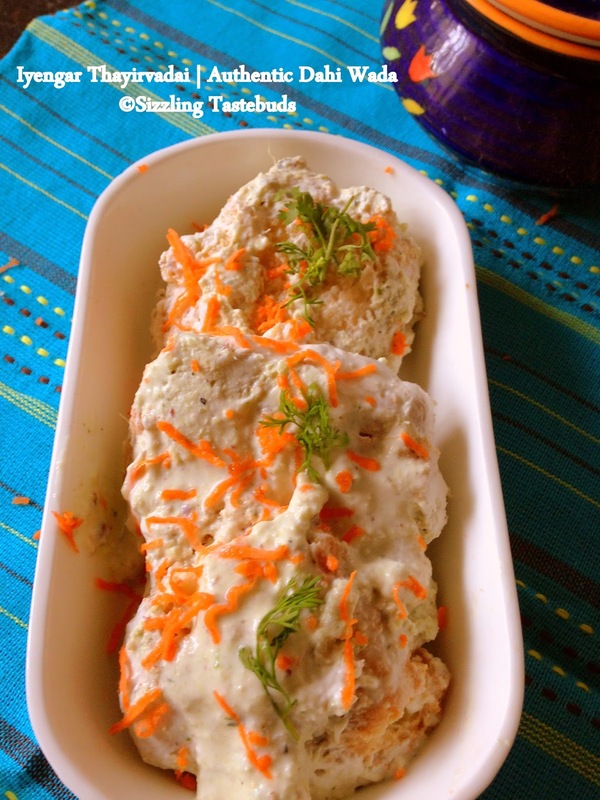 Top with grated carrots and boondi ( I didnt use the latter) and serve warm or chilled..You may refrigerate them upto 2 - 3 days (if they last that long), so on the next few days, add a dollop of fresh yoghurt, whisk it well, and serve. Thayir vada looks delicious and inviting. love thayir vadai!!! yours is toooo tempting!!! wish I could get some!! Wish i get that whole plate now..Makes me drool.. Yours is just killing me. 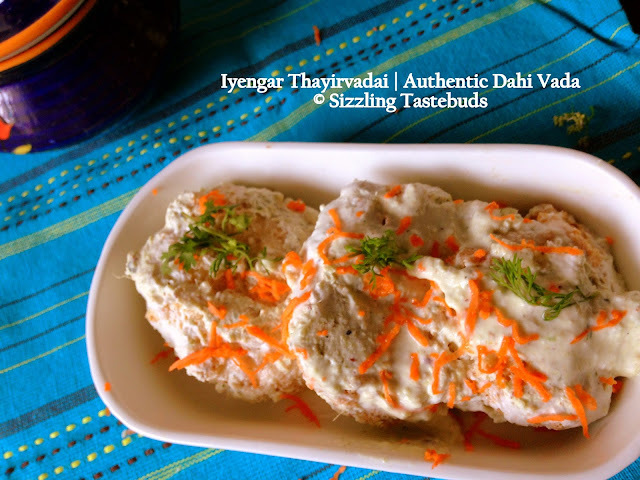 Dahi vada looks colorful and yummy. 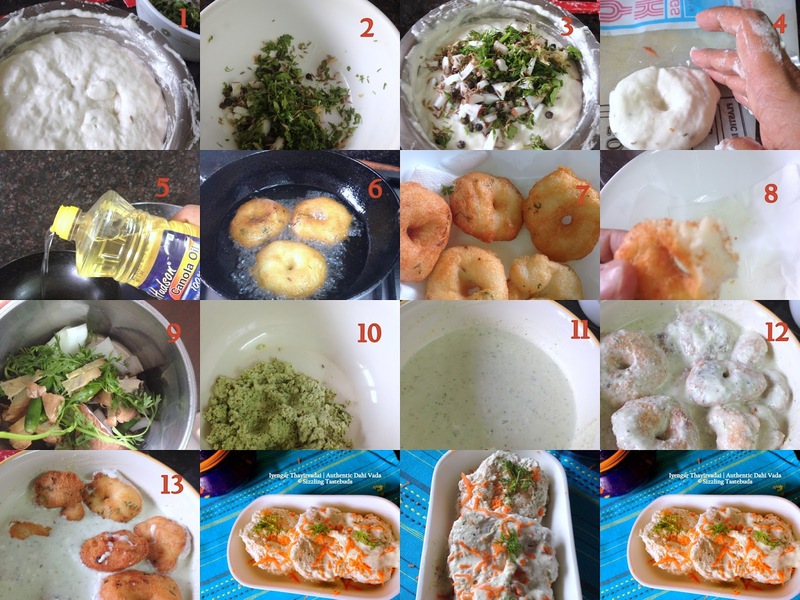 Superb..
Beautiful Dahi vada and is mouthwatering.. Thanks. I really learned a lot from it. Keep it up. my mouth is watering.. delicious. my mouth is watering loving it very much my all time fav. Lovely! Can never say no to tayir vada in any format! Super tempting thayir vadai.. yummy!! This is my favorite and ate loads of this when I was preg with lil angel. Pics are so tempting me to make them.. Tempting vadai.. one of my favorite dishes too..
Look at those fluffy vadas wow delicious looking thayirvada yumm. I didnt know this method of adding coconut mix to the curd. So yummy vadas in spiced curd..should be delicious!! We love these a lot. never tried using rice flour before must try that. Thanks.